During Christmas break, four 22 year-olds on a Mexican road trip seem bound for trouble until they, and their trip, are unexpectedly redeemed by a series of miraculous events. An entertaining and uplifting road comedy/romance. AVAILABLE NOW ONLINE/DVD | Get updates from BAJA’s official site. 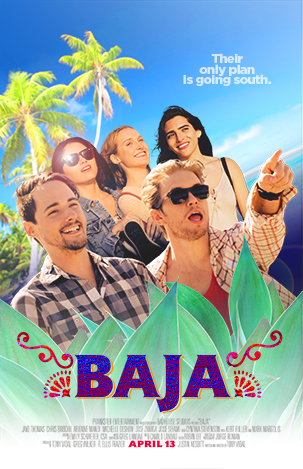 BAJA is a road trip comedy/romance with appeal to all ages, but is particularly targeted to young people, 10-25, skewing female, with high appeal to male audience as well. Will play well in foreign markets, particularly Latin America (Jose Sefami is major star in Mexico). Smart and funny, BAJA is distinguished by its inspirational and cultural elements. Christmas break setting offers additional sales potential.